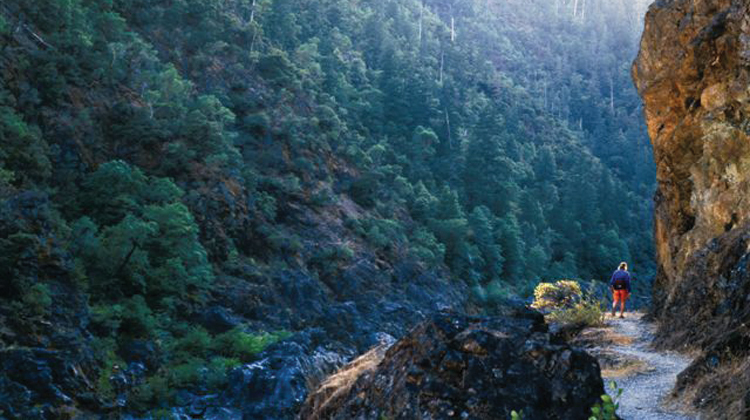 The Wild Rogue Wilderness is a prime example of the natural, scenic beauty that is seemingly everywhere in Southern Oregon. It was established as a wilderness area in 1978 to provide watershed protection for the federally designated “wild” portion of the Wild and Scenic Rogue River. This area, although accessible by car, lives up to its “wild” name. Nearly vertical cliffs and razor-sharp ridges provide a breathtaking backdrop for the pristine mountain creeks that ripple toward the rivers. The region was originally settled by hunters and gold prospectors, who were drawn to the land by the prospect it held for wealth. Little gold was ever found in the area, but as you wander through you are likely to run across 150-year-old remnants of the search. Stamp mills, flumes and trestles still speckle this otherwise undeveloped tract of land. If you are a fisherman, you will be delighted by the tremendous steelhead and salmon fishing. If you prefer pulse-pounding excitement, test the exquisite whitewater the Rogue River has to offer. Hikers love the National Recreation Trail that provides the only access year-round to the portion of the Rogue from Graves Creek to Illahe. And it should be no surprise that the Wild Rogue Wilderness is a camper’s paradise.